I know it's still winter, but it's finally warming up a bit in the northeast and I can't seem to resist anything that reminds me of spring lately. 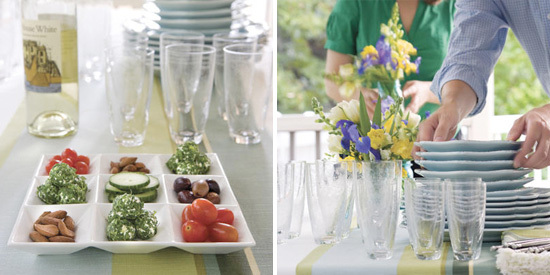 Including this lovely springtime party from Southern Living. It's perfect for bridal shower and even an engagement party. And, it can be done for less than $10 per person.﻿ For the entire party how-to with recipes, please click here. The tablecloth above is actually a king size sheet and the table runner and napkins are made from a remnant of decorator fabric. 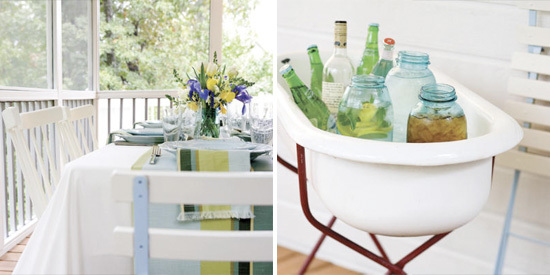 Beverages are served in old canning jars and displayed in an antique baby's bathtub. Feta Cheese Truffles are served with cucumbers, tomatoes, almonds, and olives. I just love the dip above, sounds yummy. It's Sweet Dip served with cookies, fruit and chocolate. 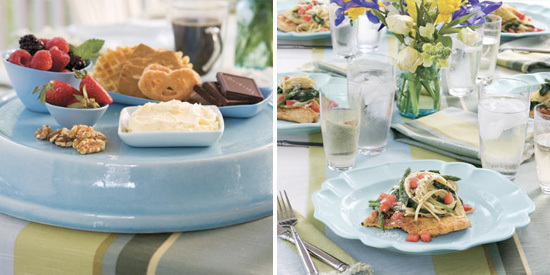 Southern Living writes that it's reminiscent of buttercream frosting secretly swiped off a cake. Recipes and more details are here.